Most companies require employees to write business trip report after every business trip. It is good business practice to write a summary of every business trip. During our business travels we at Top Travel Tips have written hundreds of business travel reports and we hope our experience can benefit you. At the end of this article, you can request a copy of our free business trip template. There is no single right way to write business travel report. Business trip reports are though usually organized as memorandum, i.e. stating the purpose of the trip, where you went, whom you met, what you did, what you learned, what recommendations you have and which actions you have, or will be, taking. It is recommended to keep notes throughout your trip and write your business travel report as soon as possible after your business trip, i.e. while the details are still fresh in your mind. Saying that, your business trip report should be summarized accounts of your trip, not detailed account of everything that took place. Our sample business trip report is organized as memorandum from you to your manager and / or sponsor of you business trip (if not the same person). Start by filling in the names and the date of writing the report. Then you fill in the business trip overview, i.e. where, when and why. You state where you went (travel destination), the dates you were on your trip (travel period), the purpose of your trip (e.g. customer meeting, seminar, etc.) and then short description of the trip. The description should explain the reason for your trip. For example, if you are sales person or area manager then the purpose of your trip could be “visiting customers”, while the description would explain in more detail your purpose for visiting them. The description could be “visiting all customers with contracts expiring within the next 6 months” or “attending the annual customer reception in the South-East area”. Then you write summarized accounts of your trip. How you write it does depend on the purpose of your business trip. If you did attend meetings, then you should state with whom you meet, the purpose of the meeting and the outcome. If you attended seminar, then you should state the purpose of the seminar and list key speakers. Remember always to focus on the key events and issues, to give clear outline that highlights the main points of your trip. 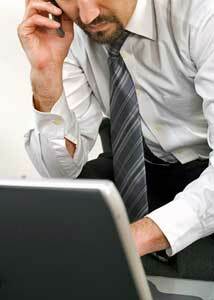 You might want to use bullet points to help you emphasize the key issues in summarized manner. Depending on your trip, but if your trip included some conclusions or recommendations, then it can be beneficial to highlight them in separate section. For example, if you “managed to renew 70% of all contracts expiring within the next 6 months”, or if you “recommend changing the annual customer reception into twice a year event”. It is recommended to highlight any follow up actions from your business trip in a separate section. For example, if you need to “visit the area again within the next three months to work on the remaining customers with expiring contracts” or if the “sales and marketing department should evaluate the cost and benefits of changing the annual customer reception into twice a year event”. All follow up actions must be stated clearly, i.e. what exactly has to be done, who is doing it and when. You will have to get your travel expenses reimbursed when you are back from your business trip. Make sure you follow the local tax laws and regulations. Our Business Travel Expense Report is therefore useful read. You can download Top Travel Tips business trip template and adjust it to fit your needs. Bear in mind there is no one right way to write business trip report. The main thing is to focus on key issues, and highlight any conclusions, decisions and follow up actions. When writing your report, have your company culture in mind. If the culture is formal, then write formal report. If the culture is more relaxed, then less formal tone might be acceptable. Leave any humor or non relevant points out of the report. Your business trip report should always be professional, i.e. clear focus on key issues, easy to follow structure and readable language. 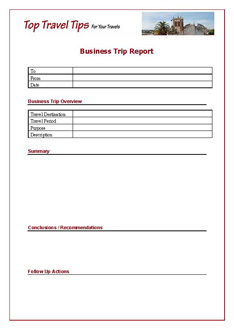 Click on the button below to claim your free sample template of business trip report. Ps. don't forget to check our Top 10 Business Travel Tips that benefit both you and your business.